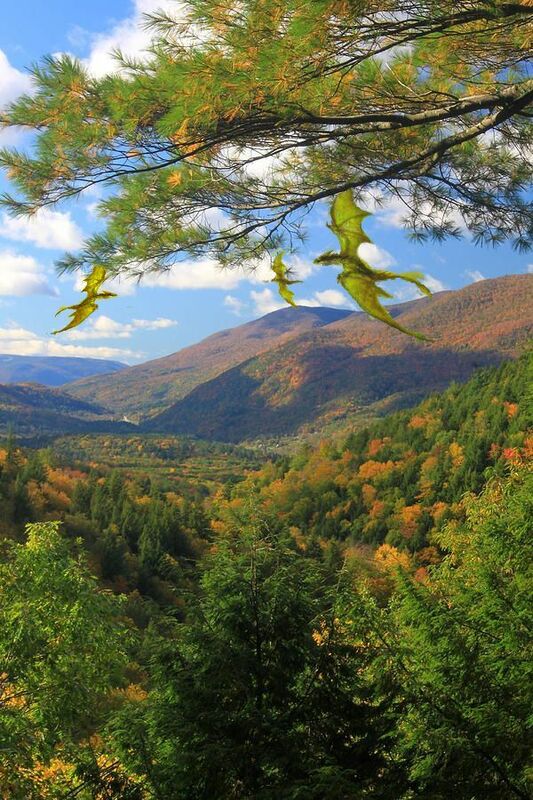 Heading north today, up through the Green Mountains, into the heart of local Dragon Country. It’s leaf-peeking time, and the colors are stunning. 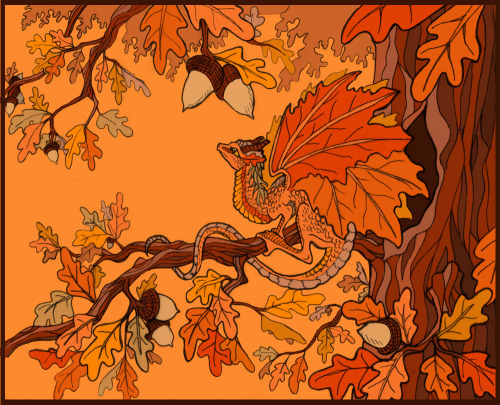 So today, I thought I’d share some decidedly autumnal Dragons. 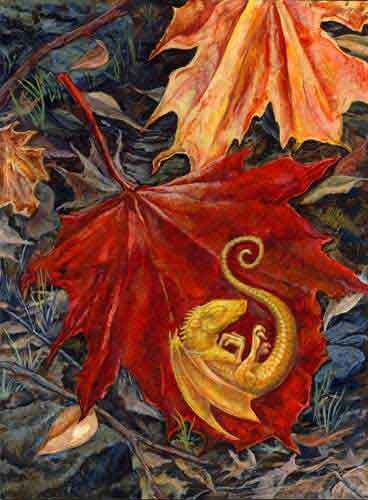 They’re not always easy to discern among the foliage, but look hard and you will find them. And be careful not to scare them. 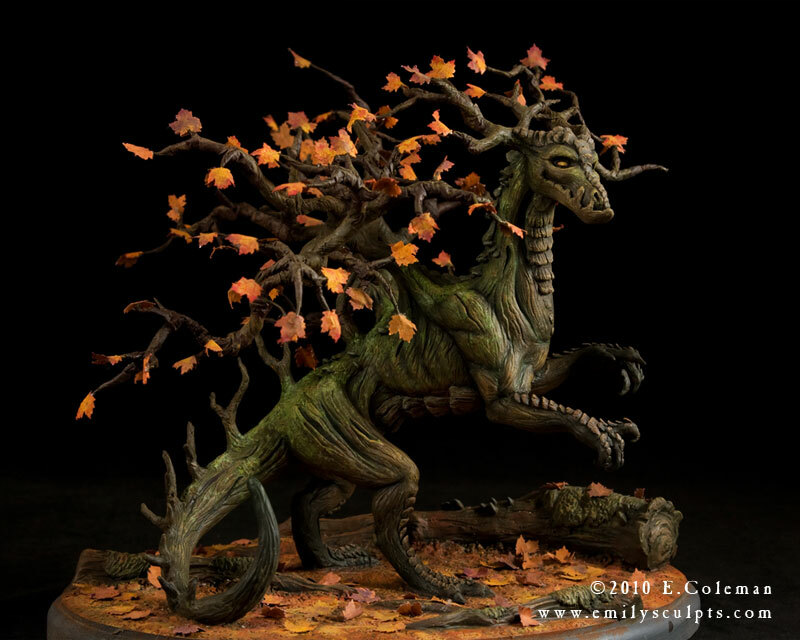 As mentioned before, a little wayward dragonfire tickling fallen leaves – even if puffed in self-defense – and whole mountainside could go up in flames. 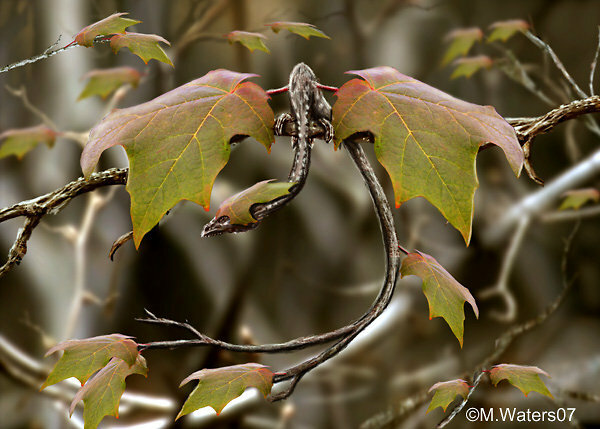 And keep your eyes peeled for the littlest ones – the dragonlets hiding in the leaf litter…. Look high, look low. 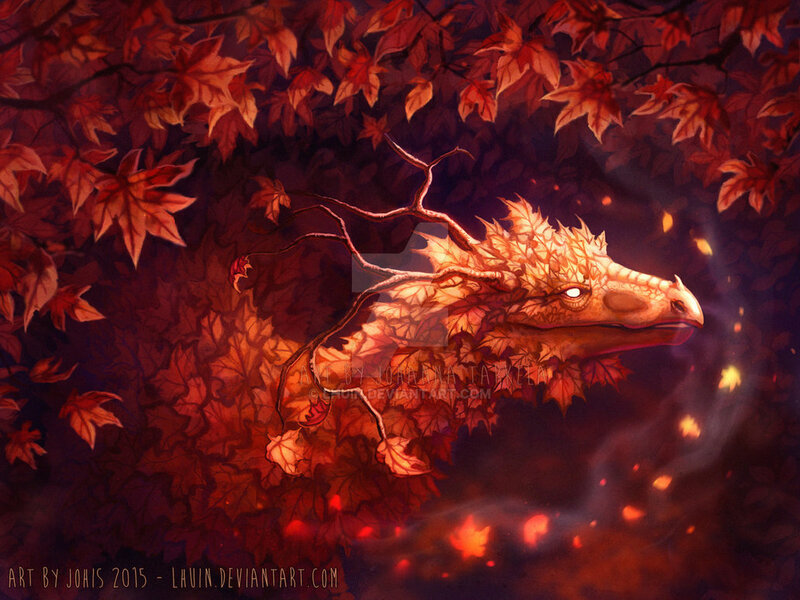 Enjoy the glory of Dragons in October! 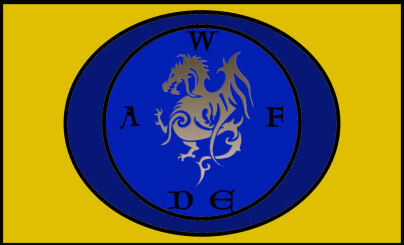 It is Columbus Day here in the States, or as we like to call it, New World Dragon Day. Here at the Nest we have a chinchilla emergency so I am sharing an NWDD post from years past. As any school kid knows, Columbus was not the first European to reach the Western Hemisphere. That was Leif Ericson almost 500 years earlier. 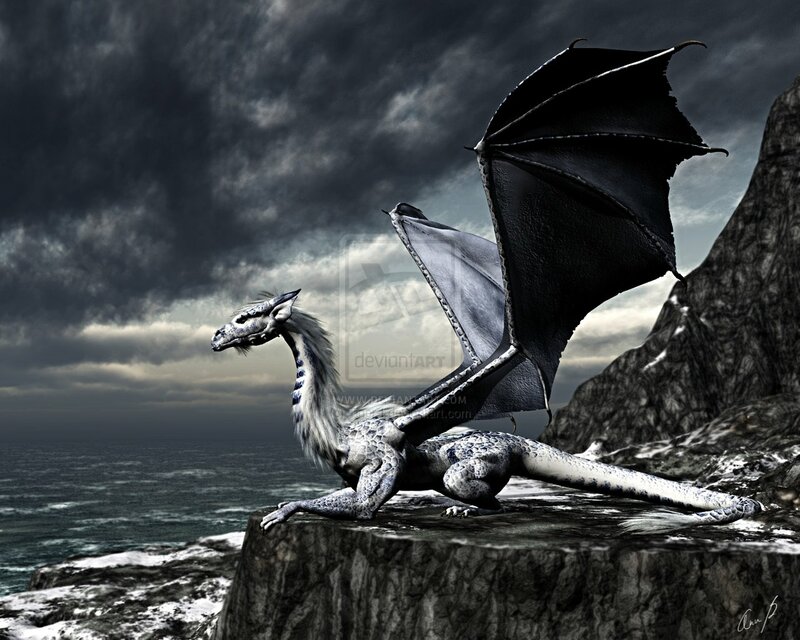 But the Norseman’s voyage took him to the northern climes, where cold-weather Dragons frolicked with narwhals and hunted the Grand Banks for seal and sword fish. 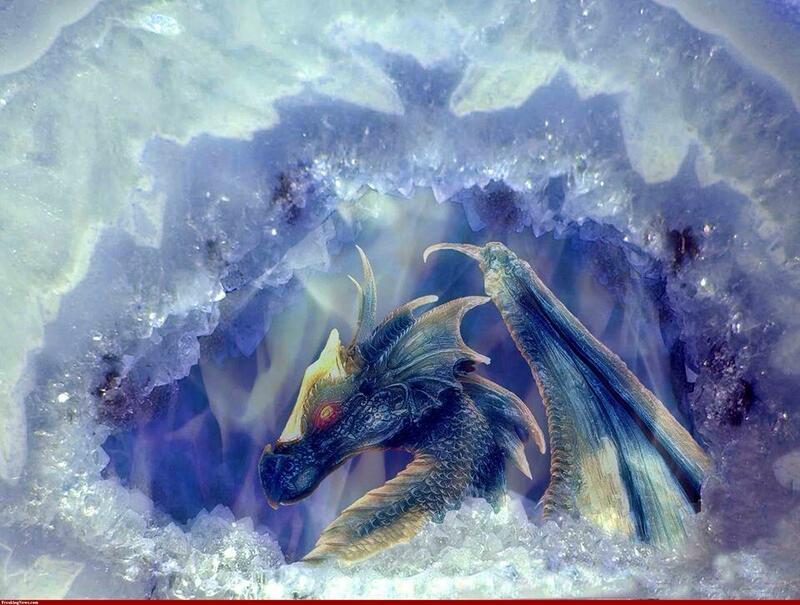 Hence we celebrate Frost Dragons on October 9th – Leif Ericson Day. But, in 1492, Columbus was the first European to land in the tropical and subtropical regions of the New World. 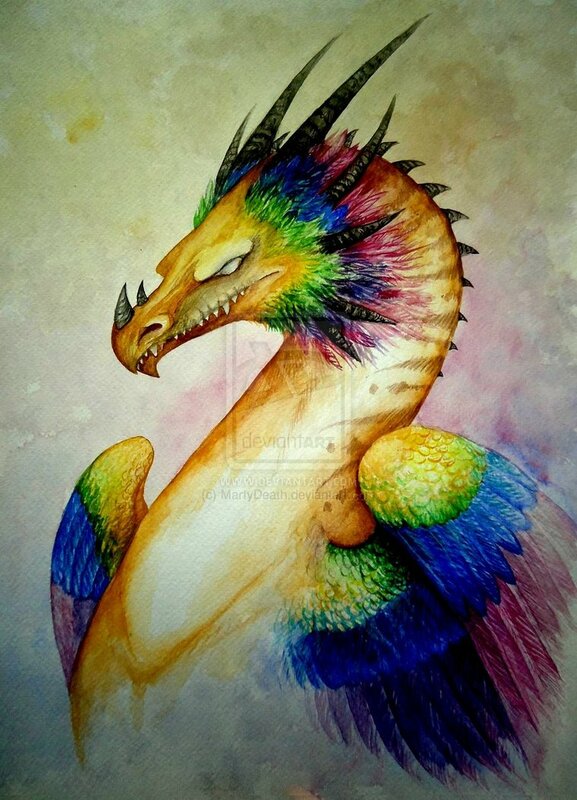 So it is, on Columbus Day, we celebrate the reclusive, rainbow-hued Feathered Dragons who were suddenly having close encounters with pale Europeans and not liking it one bit. 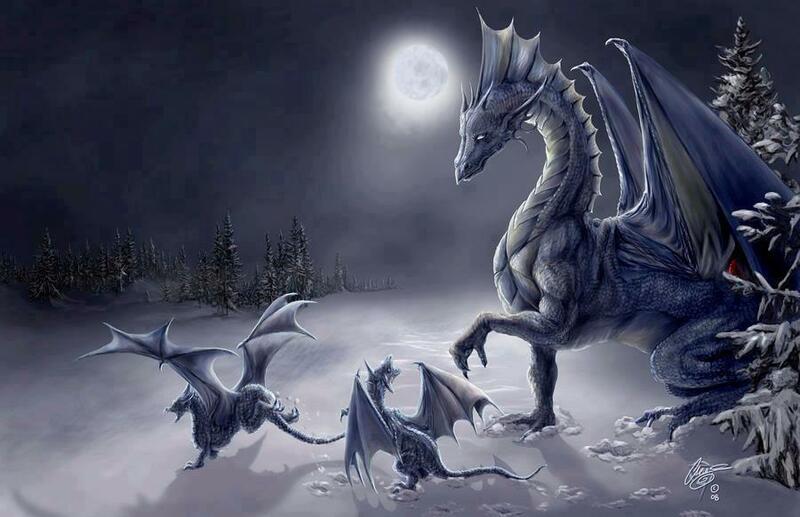 “Feathered Dragons are the smallest of the True Dragons…. They flit in and out of the rain-forest canopies, wrapping their lithesome tails round boughs of kapok and purple heart. In environments full of the little-known and very unusual, they are the epitome of both, so much so that some doubt they still exist…. 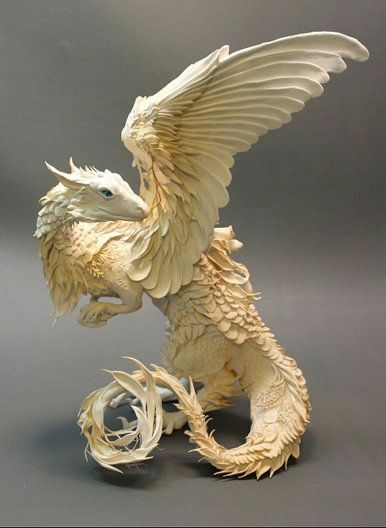 Compared to other True Dragons, our feathered friends, while not minute, are definitely on the miniature side. This is a strict function of habitat. Living in and on the edges of the planet’s dense rain forests, these exquisite beings cannot sustain the great size and bulk of their cousins. Theirs is a realm in which lightness and flexibility mean survival. 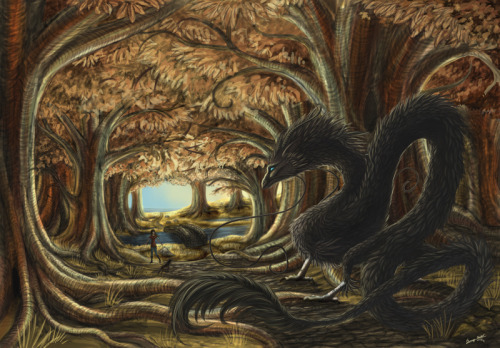 Mature Feathered Dragons rarely grow to more than 6 meters in length or weigh much over 300 pounds – about 10% of that being their colorful, plumed integument. They have lean, reptilian musculature stretched over a hollow-bone frame. Scales protect belly and lower legs; feathers are everywhere else. Dense bristle feathers run from head to nape, forming wide facial discs and ornate crests radiating round barely visible hornlets which never develop beyond the nub stage. Lustrous contour feathers blanket the rest of their bodies. 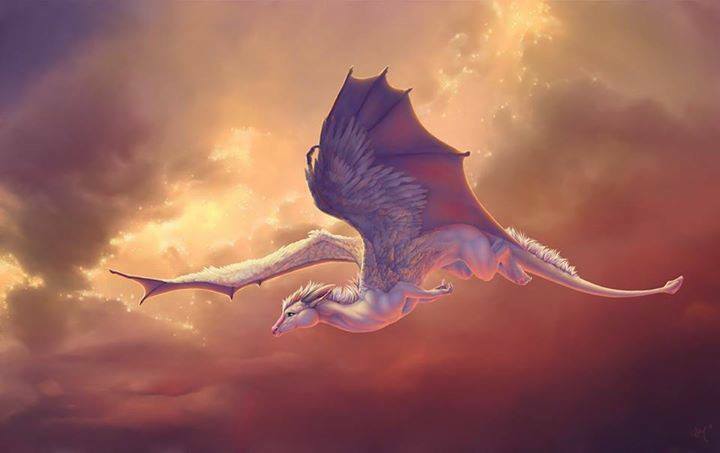 Despite the Dragons’ enormity, these outer plumes are comparable to those of the large avians in their environs – macaws, harpy eagles, horn bills, and eagle owls. On the rare occasions such feathers make their way to the forest floor, they are generally assumed to come from more mundane moltings. 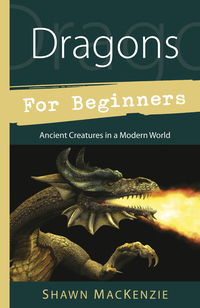 This misconception affords the Dragons welcome protection from hunters’ sanguine ways. 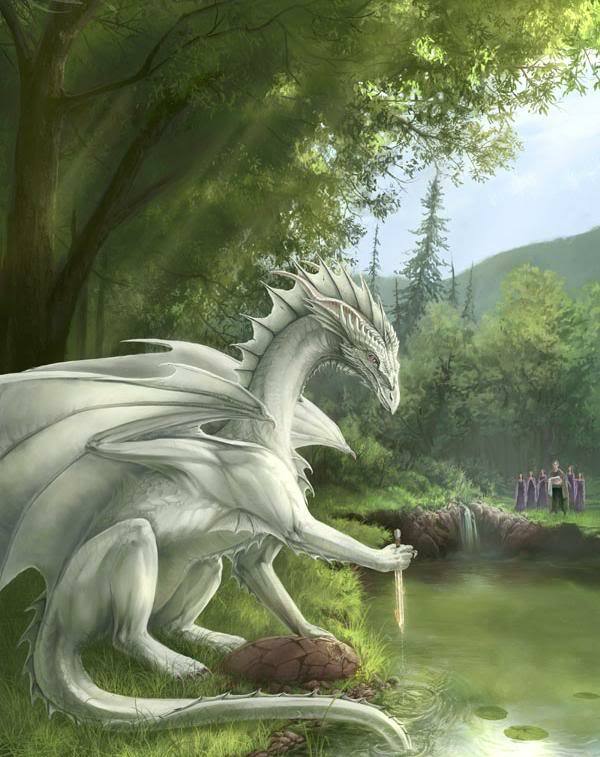 A fine undercoat of semiplumes – and careful preening – make Feathered Dragons naturally waterproof, just what they need to shed the weight of incessant forest showers or when cooling off in crystal cenotes. Where their range bleeds into semi-arid plains – lands deforested by climate change and human greed – this same plumage provides them with insulation against the daytime heat and nightly cold. These are the gems of the draconic pantheon we celebrate today. 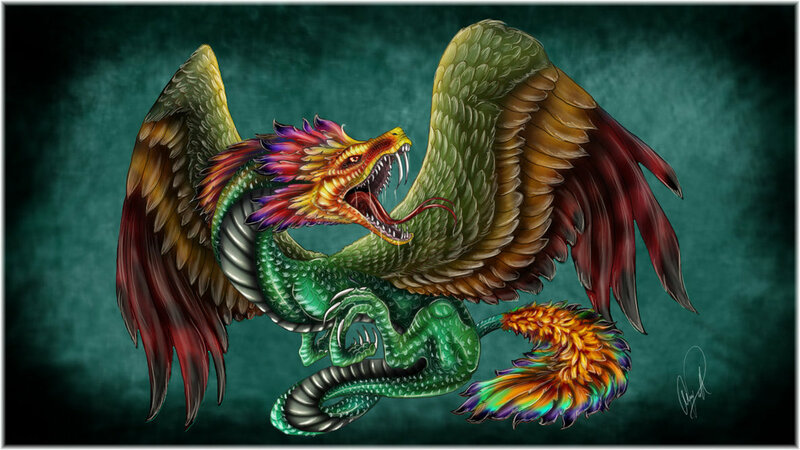 Descendants of the Sovereign Plumed Serpent, of Quetzalcoatl and Kukulcan, they struggle to hold their place in a world foolishly erasing their habitat before it and its denizens are understood. If you travel to the Amazon or the forests around Iguazu and the Canaima Uplands – areas still wild enough for Feathered Dragons to enjoy – look up through the canopy for an unexpected flash of color. It might just be an elusive plumed Dragon on the wing. And you shall be a fortunate dracophile, indeed. 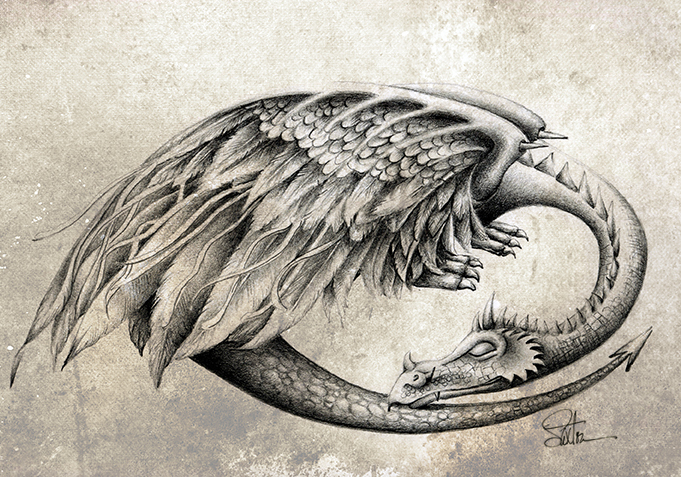 In all of the avian world, only the wandering albatross has a wingspan to even approach the Feathered Dragon’s reach. 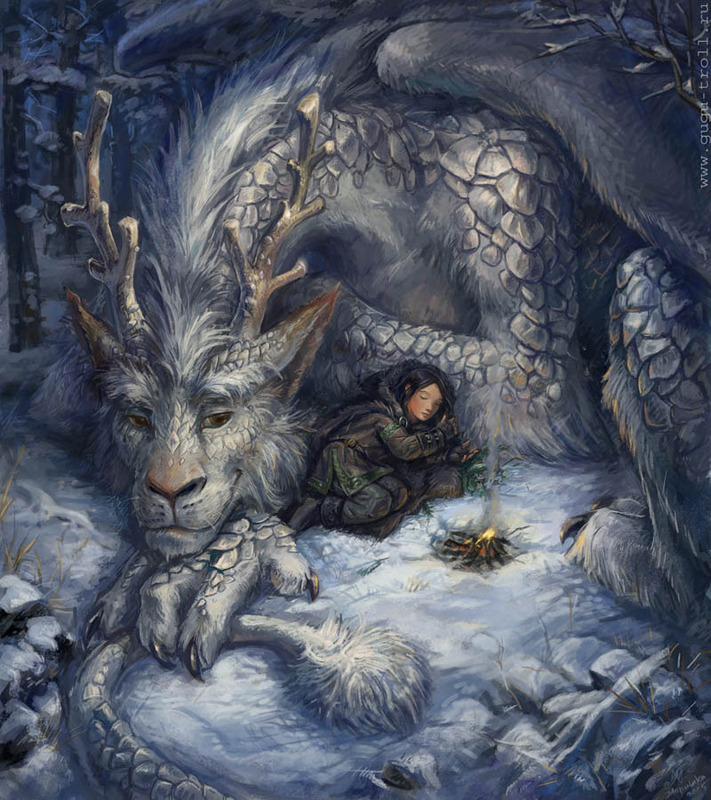 Wishing everyone a very draconic 2015! 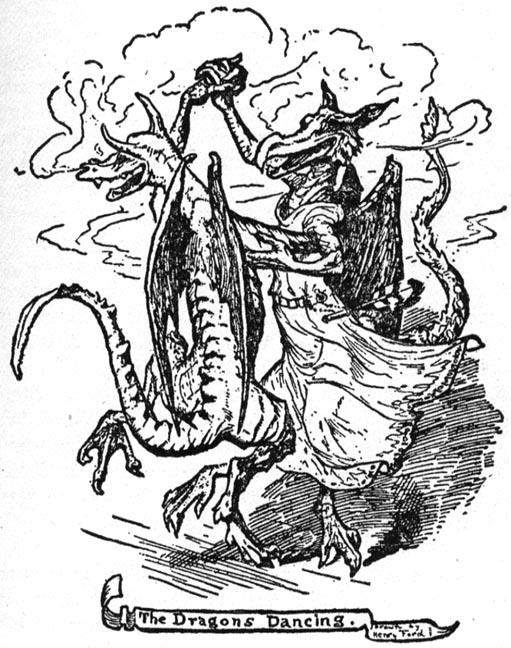 From whisker to tail spade, Dragons understand the essential joy of dance. 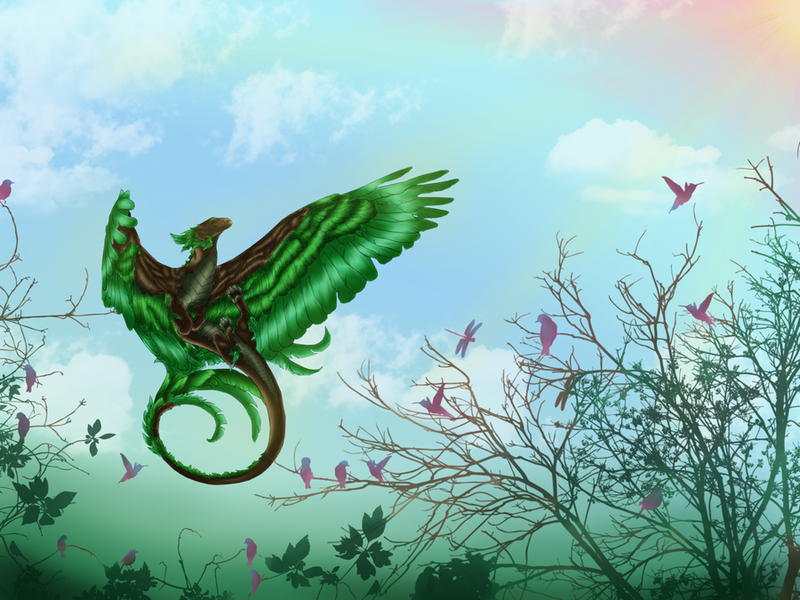 They embrace the rhythm of Earth and season, the ebb and flow of life, tapping talons and flapping wings in exuberant glee. Weyrs in autumn are particularly suited to terpsichorean fun. Late August to the Autumnal Equinox is the time for courtship and mating. Bonds are made and celebrated in anticipation of hatchlings to come. 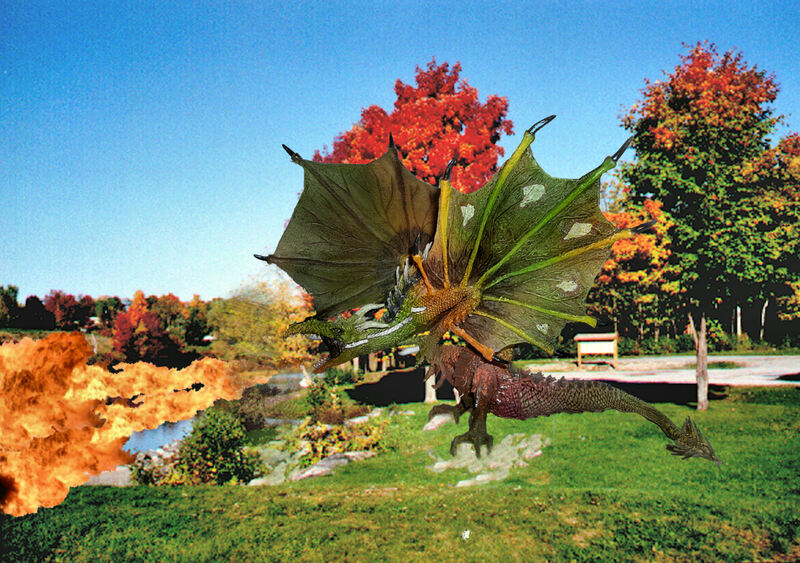 By October, paired Dragons are settling in. They spend their time hunting (mom is eating for between 2 and 7), building nests, and lighting up the night sky with expectant fandangos. the Earth shakes and the Sky trembles. 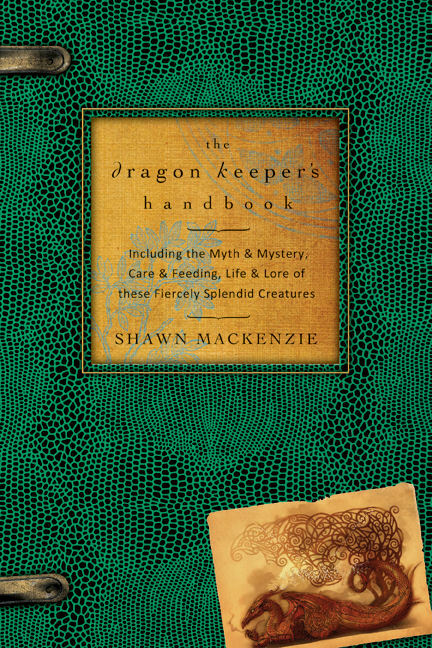 Watkins Mind Body Spirit – and Dragons! 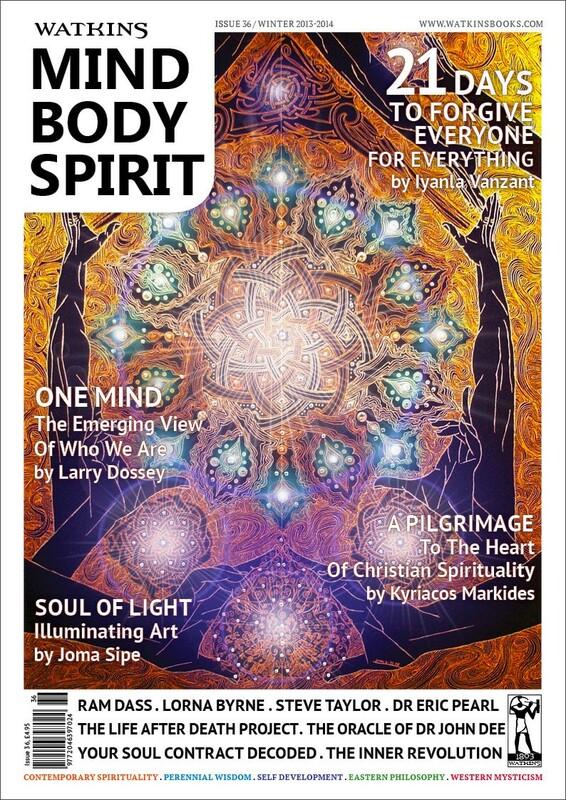 The Winter 2013 issue of Watkins Mind Body Spirit is now out including a piece by yours truly, “On Wings Everywhere Ascending: The Relevance of Dragons in the Modern World.” Watkins is THE resource for paranormal and occult studies across the pond. I am thrilled to be included in such company. 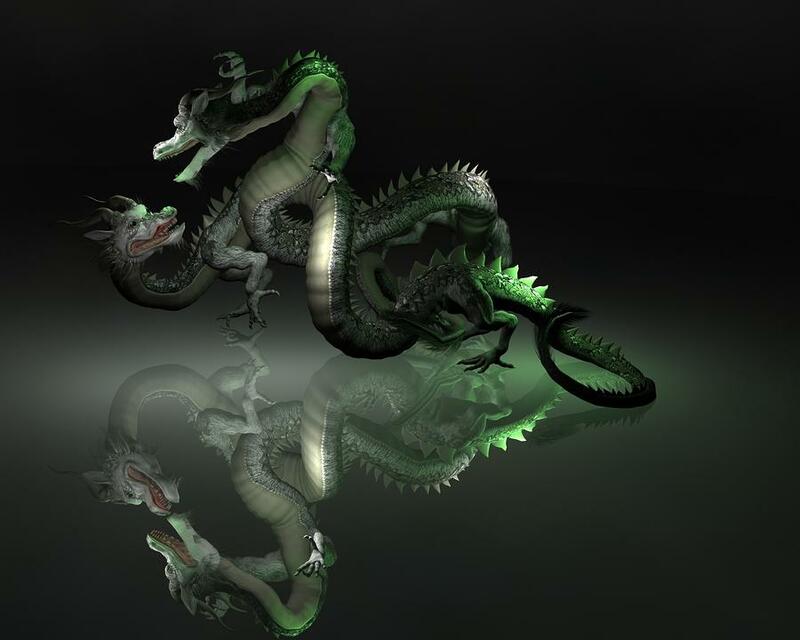 Today is Moment of Frustration Day, a day with which many of us who walk with Dragons are familiar. 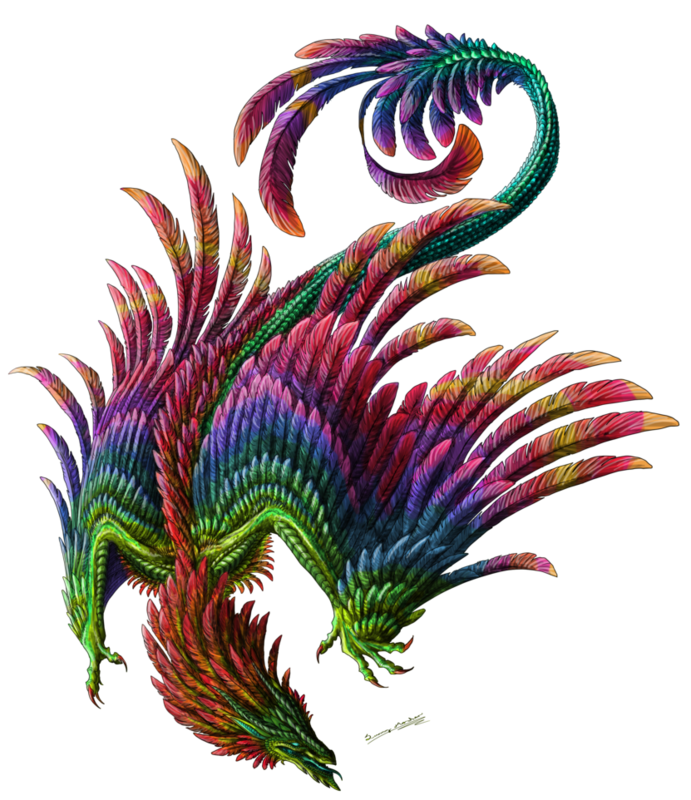 After all, how many moments of frustration do we have trying to open benighted eyes to the wonders of Dragons? So, on this lovely Saturday afternoon, I wish to introduce you to a young friend of mine, Joshua Snow. 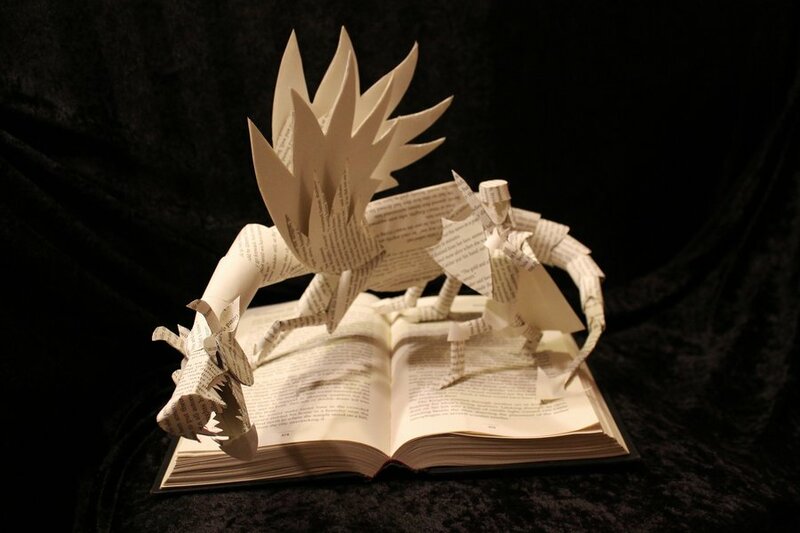 Budding scribe and dracophile, Josh knows exactly what it means to have eyes opened to the wonder of Dragons. As the scales fall, so does the frustration. May all our friends be so fortunate. 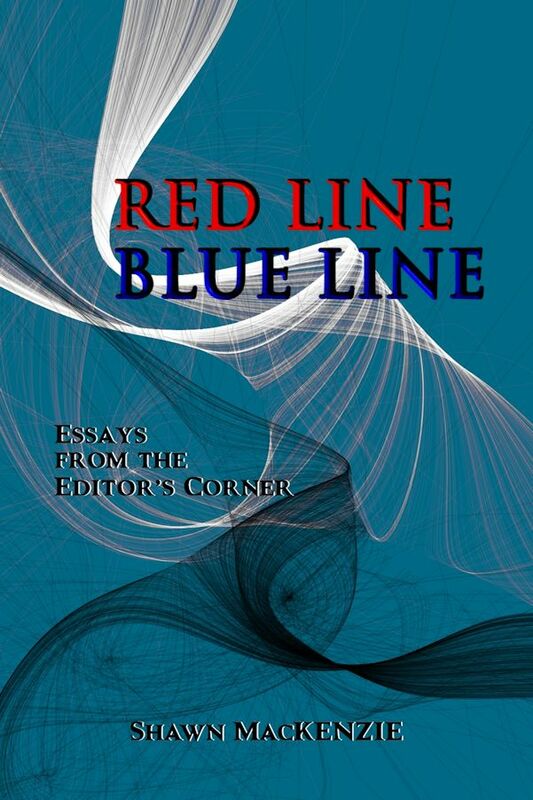 I have been writing since I was fifteen. The first time I wanted to write a serious story was when I was angered by the plot and ending to a book I ‘d been excited to get my hands on. The title grabbed me, as well the story’s mystery, and the little bit of information I could read on the cover blurb. I was actually so excited that I tried to predict what would happen from beginning to end. Sadly, I found the story highly disappointing. Not only were my predictions wrong but also the way the story turned was horrible. My level of disgust was so absolute that I decided to rewrite the story the way I imagined it. I used the same title and characters in the original story, but told it my way. Of course, I would not be able to publish it due to copyrighting stuff I didn’t know about before. When I found out about the legal stuff, I decided to write it again and change a lot. The characters and setting were completely different, but the plot remained sort of the same. I worked on this story for years, rewriting it and dreaming of it selling loads of copies. I had the ambition of making it big as a writer. However, when I finished the story years later, I hated it. I thought it was garbage. Immediately I threw it away and stopped writing long stories after that. I just concentrated on poetry and short stories that were only a few pages long. Between then and now, I learned a lot about writing and myself, but there are things I still struggle with. One of those things is writing for myself and only myself. When I wrote before, I did it because I wanted to obtain the image of being admired and inspiring others. 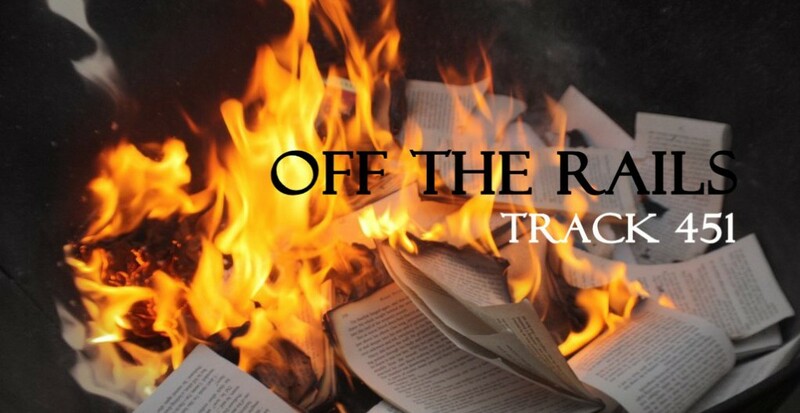 I had no vision of doing this because I just wanted to please myself by writing a story the way I liked it. I actually thought such a view was selfish because it is only including me and no one else. I thought, “An author has to care for his audience. He cannot just think of himself.” Well, it is not that black and white. That is also another thing I am working on, seeing the greys. Which brings me to dragons. It all started early on Halloween morning, 2011. It was cold, my favorite kind of weather, and the sun was beginning to rise. 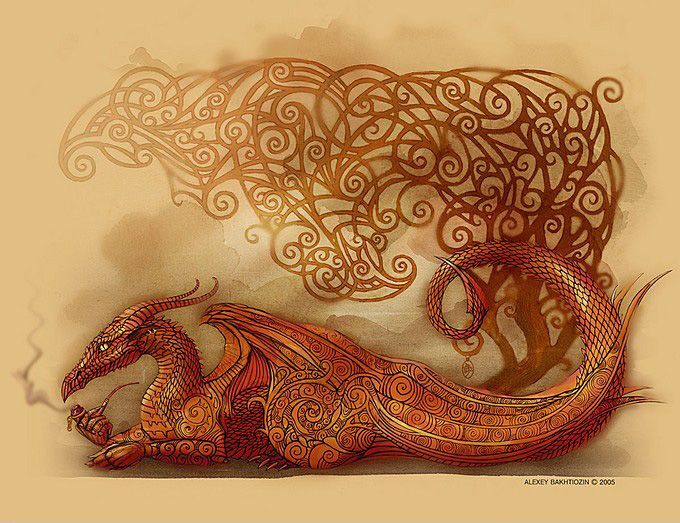 I was on my laptop looking at stuff related to dragons, one of my favorite things in the world. Somehow, and I do not remember exactly how, I came across an article made by no other than Shawn MacKenzie. To my surprise, it was talking about Dragons, but in a way I did not expect. 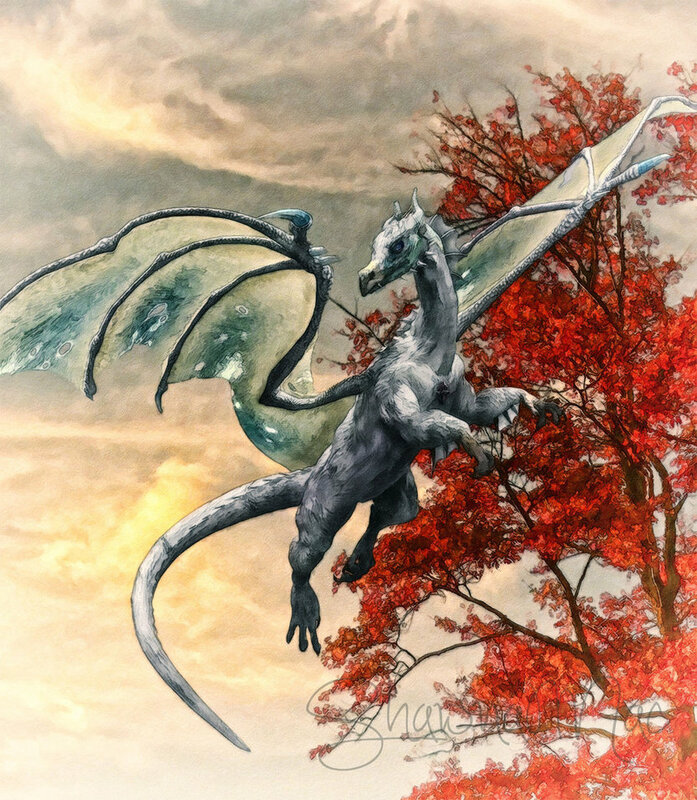 The article on her blog site spoke of Dragons visiting our world from theirs, and some coming to stay, and how on Halloween that void between the two worlds came to a close and was the last day it remained open. Reading it filled me with joy and wonder. 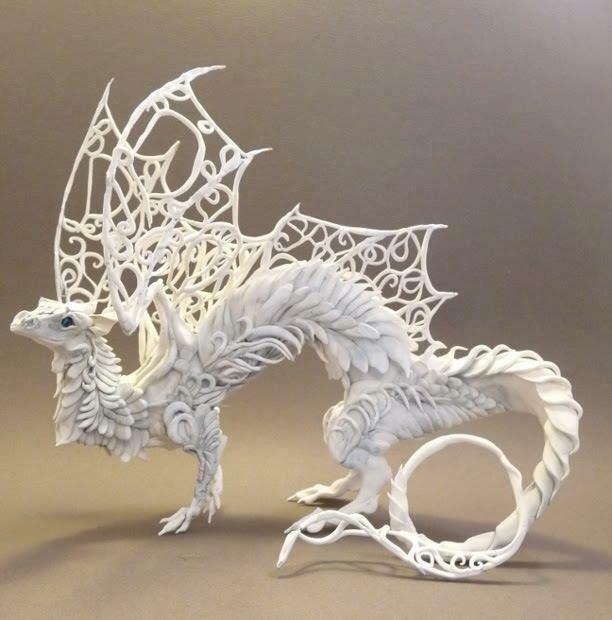 I told a friend of mine on Facebook about it because he too loved dragons, and we both believe they still exist in this world on a spiritual level. He loved it, and said he was going to go outside and look around, hoping to spot a dragon somewhere. 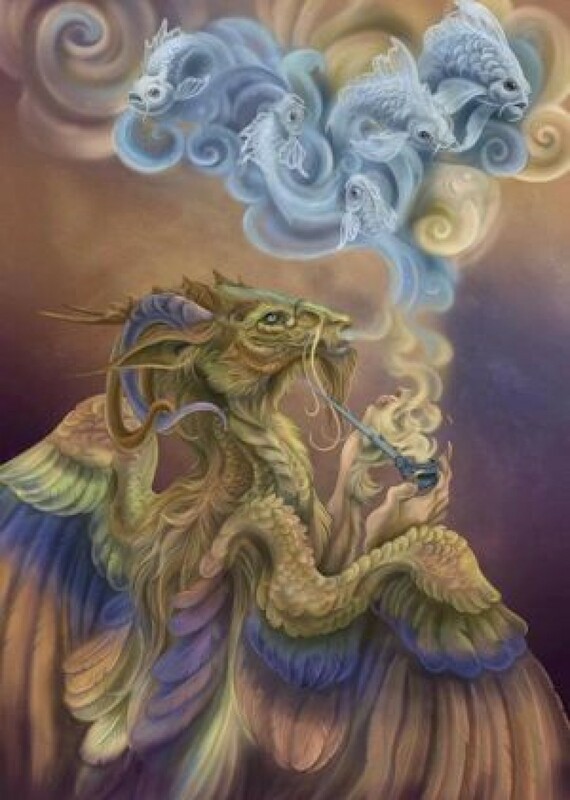 The idea seemed silly to me, for what he said also implied a dragon physically being there, but I was taught to be open-minded even to things that sounded utterly insane. I grabbed my jacket and went for a walk. It was so cold I could see my own breath. There was a field just outside my neighborhood I hadn’t been to in a while. Glass buildings and a dirty ditch that always gets trashed surround it, but the field itself was beautiful. Though it had rained in the middle of the night and the grass was still damp, I found nice spot to sit down. The sun was still just rising, and the light shined between two glass buildings.. For some reason, I felt the need to look behind me. 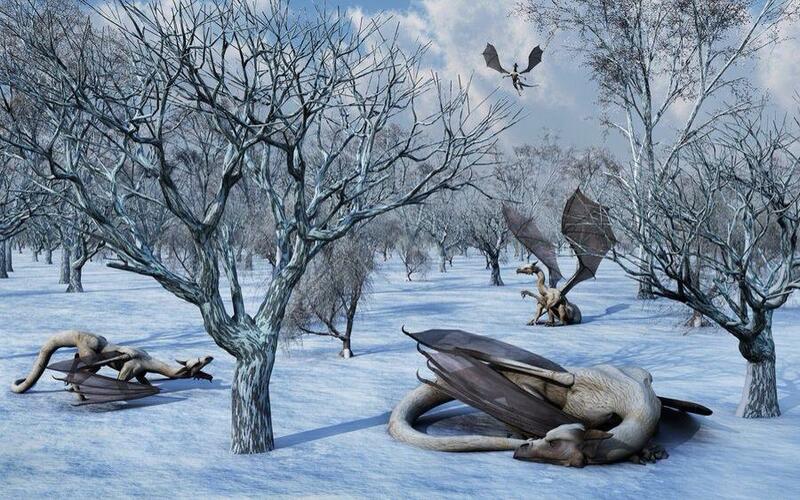 When I did, I saw, for less than a split second, a tall white dragon standing in front of a dead tree looking at me. It disappeared just as fast as it reappeared. I was startled yet amazed. 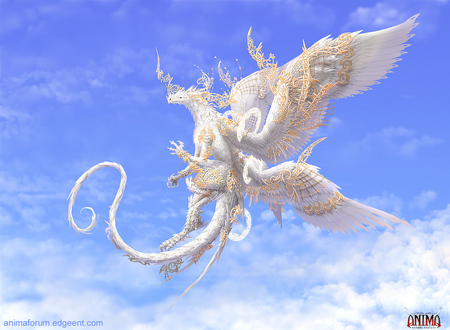 Still I remember that to this day, and I even remember seeing its scales shining from the sunlight. I ran back home and got on my laptop, looking at the comments on this article by Shawn MacKenzie, and I decided to comment about this spiritual experience. Soon enough Shawn commented back. 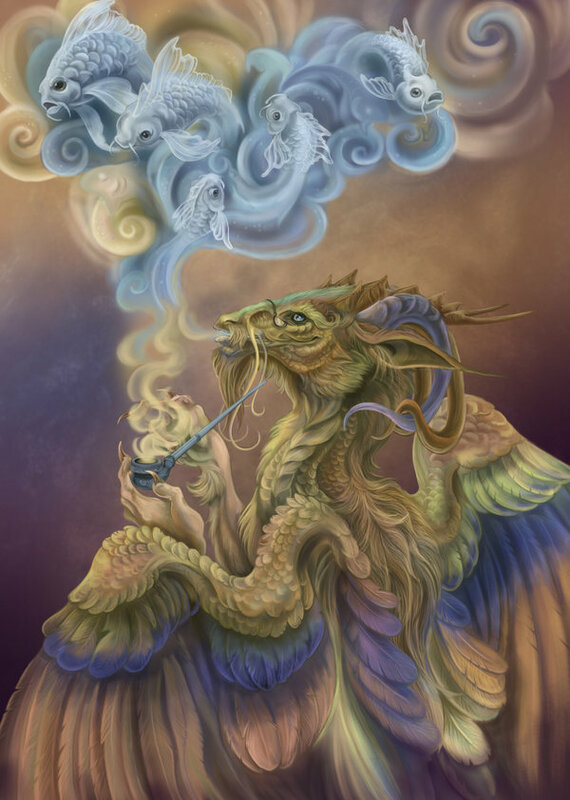 She told me the Cosmic Dragon was smiling upon me. Such a comment brightened me, and what I found funny and more than a mere coincidence is that I always wanted some kind of a special bond with dragons. This was a magical and important day. It was the day I started writing my first fantasy. Later on, I found out that Shawn MacKenzie had a Facebook page, and I befriended her and began to talk to her. We have been friends for almost two years and we talk every weekend. Shawn is a friend I will remember for the rest of my life and forever treasure. She is a valuable dragon friend who has guided me like the dragons have. 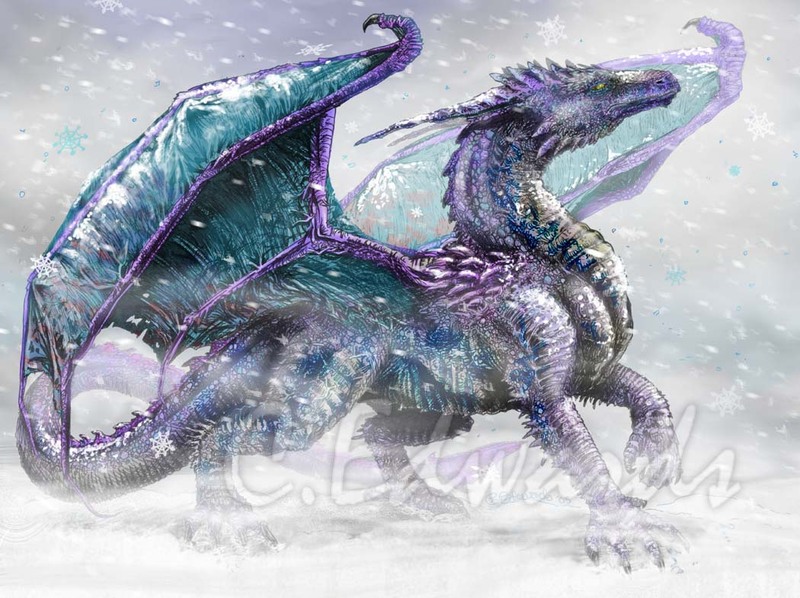 Here in the Northern Hemisphere, thermometers are dipping into wintry territory, leaving frost on the pumpkins and reminding us to pay homage to hardy Frost and Snow Dragons around the world. diet, hunting caribou, seal, fish, even migratory fowl (and in the south, penguins). The nutrients most Dragons pick up from greens, Polar Snows or Frosties– as they’re affectionately called – get from sea weeds, vitamin-rich lichens, and indirectly from ingesting herbivores. Though Frosties seldom cross paths with humans, our species footprint impacts them more and more with the increase in climate change and the melting of the polar snows. 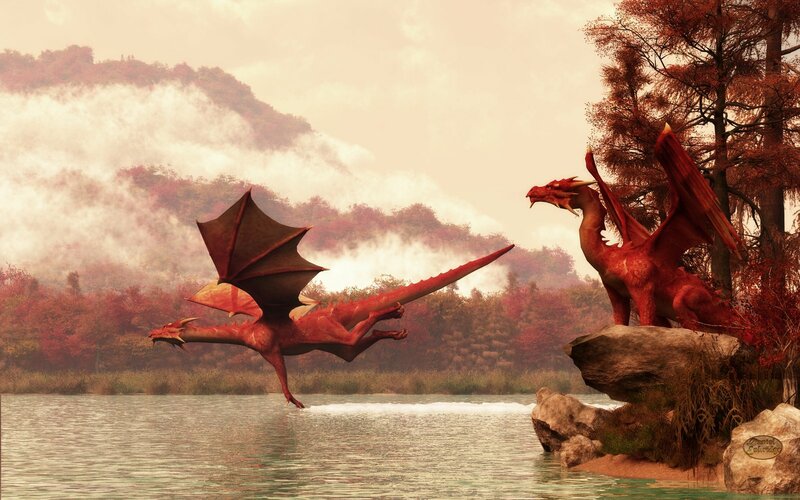 Flight gives them a greater hunting range than the earth-bound predators who share their habitat, but Dragons are not immune to the destruction of their ecosystem. The ever-increasing effects of rampant carbon emissions, pollution, and global warming make accurate Dragon information – numbers, health, etc. – all the more essential. 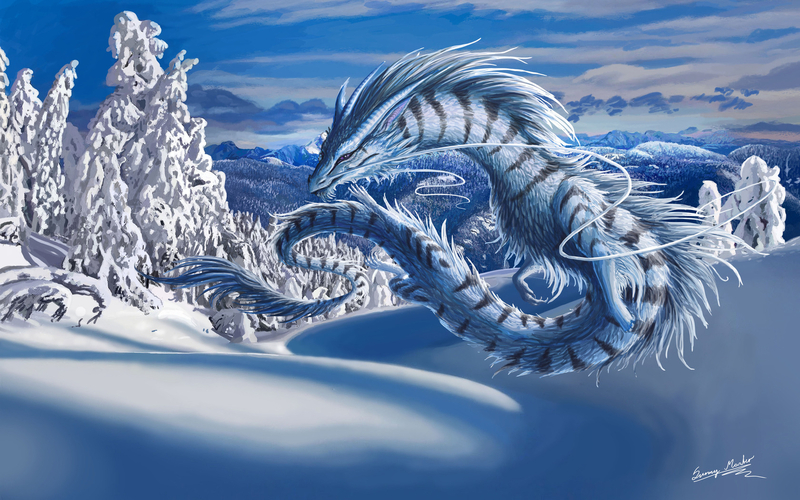 As with other Dragons in other environments, the Polar Snows are great measures of the health of the planet. We must watch them with care.